choosing TABS to see the page change results. Thanks ! AMAZON 6 mil. 4 year GREENHOUSE PLASTIC. 20' x 100', which is enough to make 2 dome GREENHOUSE for just over $200. Specifications: 14x14 Weave - 1200 Denier Yarn - 13 to 14 mil Thickness / 240.6 Grams per Square Meter / 440 Grams per Lineal Meter / 8.49 oz. per Square Meter / 7.07 oz. per Square Yard / L.D.P.E. Coating: 2.8 mil coating on each side / Extra U.V.I. Treatment 5% UVI. JUST ONE TARP 18' X 50' SHOULD DO THE JOB. You can or SHOULD be able to cut 6 pieces from this tarp. Waterproof Treated Canvas, Great for restorations of vintage military vehicles & equipment. Also called waxed canvas or oiled canvas. Safara-Tex vinyl is great for commercial and restaurant furniture re-upholstery as well as cars and boats. NOTE: WICKERJUNGLE website and this webpage hopes to soon offer you a YURT-TENT QUALITY VINYL COVER of your color and material choice using the COLORADO YURT COMPANY fabric samples (click above link to order FREE samples) from which you choose the material and it is then manufactured and shipped to you to place atop your extremely strong PVC framework ! One of the most cost effective ways to cover your YURT-TENT multi-use dome shelter is to use "greenhouse plastic." This allows you to obviously use the dome tent as a "greenhouse:" however, you can THEN cover your "greenhouse" tent with an ADDITIONAL opaque outer cover material to THEN use the "greenhouse" as a livable shelter as well. I recommend that you buy enough "greenhouse plastic" to make a 2 or double-layer floor and enough left over to make your cover for about $120 to $150 dollars. The surface area of this dome is 386 square foot. Since the floor is approx. 16' wide, you want a minimum stock of 18' to 20' wide to allow one solid sheet plastic to be used on the floor in order to send ground gases out to the edges of the dome shelter and eliminated from the interior. Also, the solid sheet should go PAST the edges of the dome frame by a foot or two - which means using a minimum width of 18'. So, buying this width of plastic implies and will require that you follow the outer-cover blueprints, cut 6 pieces from the pattern, and then glue the 6 pieces with BUTYL RUBBER CAULKING to make a "fitted" aerodynamic cover that "fits" or hugs the frame with no draping and wind resistance. Now, the circumference of the dome is about 50 feet; therefore, to go from the base of the dome, up the wall, and to the other side base - you need about 26' to 27' widths. So, if you intend on taking a shortcut (not making a "fitted" cover by cutting six pieces and gluing) - but, instead, intend on putting ONE BIG PIECE of greenhouse plastic over your dome frame - you need to buy a width (and length) of NO LESS than 27' to 30' widths of plastic. Obviously, since a dome is round, the length should be at LEAST the same! Therefore, if you take a "shortcut" - you need a solid piece of at least 30' x 30' approximately to drape over the entire dome to effectively cover it with no air gaps - or sizes just bigger than that. You can do the math yourself when or if you decide to order enough EXTRA "greenhouse plastic" to make the outer cover and then ahve enough to make one or two layers of floor as well. However, please use "greenhouse plastic" or your cover will break down in just a few months ! Personal and private organization can thus make an entire "greenhouse" shelter for about $300 that will house 10 to 12 people, so religious organizations actively involved in disaster relief can consider this "process" to get the most "bang per buck." Click on the link below to take you to WALMART.com page that sells this 5 year UV protected TARPAULIN that is 12' x 24' for $102. You ORDER and PAY online and have it sent directly to the WALMART store near you to pick up. The TARP selections below have been selected for their price and durability. Many of them, you can click and order directly from this page for your convenience! So, you can order your own material and send to us to process and fabricate your dome outer cover, or you can use the BLUEPRINTS and make your own, or we can order the materials for you and make your outer cover for the seamstress labor cost listed on the labor page. BUY IT FROM: ABCSUPPLY.com 505-988-8077 Santa Fe, NM .60 / sq. ft.
USE LEISTER.com HOT AIR GUN to seam seal it together. 800-241-4628 Heely Brown, Altlanta, Ga.
BEANO will email list of thermal plastic mfngs. You need to ORDER either (6) Tarps that are at least 10' x 15' or ORDER on big tarp at least 20' x 30' from which 6 pieces can be cut. Once you order it, you will specify to ship it to our factory to cut and sew your dome shelter's outer cover. TARP DESCRIPTION: Hefty woven poly tarps are coated with polyethylene to resist the elements. Camo on one side, beige on the other. Rust-resistant grommets. So, this is a 25' x 45' THICK WHITE 11-12 mil TARP if you CHOOSE this TARP to make an ALL WHITE outer cover. • Grommets Approx. Every 18"
So, this is a 30' x 40' CAMOUFLAGE TARP needed to make your dome cover if you CHOOSE this TARP to make YOUR camouflage outer cover. So, this a 20' x 40' CLEAR TARP needed to make your dome cover if you CHOOSE this TARP to make YOUR large dome outer cover. Clear Poly Tarps have many uses within industry and domestically as they are manufactured from tough low density polyethylene, laminated on both sides with high density polyethylene. Clear covers are 6 oz per square yard, UV 3% treated, 3X3 polyester mesh count and 12 - 14 mil thick with grommets ever 36” apart and corner reinforcement and furthermore rot & water proof . Clear Tarps are easy to handle and lightweight. Black & White OPAQUE (no light) silage tarp - 5 mil. This 8.5 mil thick polyethylene covering offers an amazing 8 year warranty against UV degradation while the rip-stop fibers resist tearing. Material is only available in a 81" wide configuration and is priced to sell by the lineal foot. Unique yellow/white striped design can be used for sidewall covering, tarps or any application where a durable long lasting plastic is desired. Lead time: This product is custom fabricated upon order. Lead time is 3-4 weeks from placement of order. Due to size and/or weight, this order may need to ship via Common Carrier instead of Ground Parcel Service. To obtain the correct freight charges be sure to select this shipment method upon checkout. Please phone IGC customer service at (888) 281-9337 if you have any questions regarding shipment of this product. CAMOUFLAGE TARP - 4.8 oz per square yard. Our Camouflage Tarps are made of heavy-duty fiber reinforced polyethylene. Each Camo Tarp is washable, shrinkproof, rotproof and comes complete with rope reinforced edges, rust-resistant grommets and reinforced eyelets. Camouflage Tarps are all temperature/all season outdoor covers that are great for a multitude of applications. 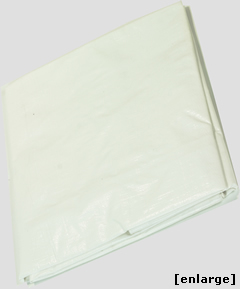 Super HEAVY DUTY White Tarp - 14 mil - 8 oz. per sq. yd. Super Heavy Duty Tarps - Feature 14 Mil thickness, 14 x 14 Mesh Count and weigh in at 8 Oz. per square yard. These durable, waterproof poly covers come complete with rust resistant aluminum grommets every 18 inches. Reinforced corner guards and rope lined edges make these tarp covers great for year round dependability. Each Super Duty Tarp is treated with UV agents and include added fade blockers. The heat sealed material is comprised of rip stop technology and is 100% waterproof. Costructed of triple layer polyethylene, the super duty poly tarp includes anti-aging, anti-yellowing and anit-microbial agents for a longer lasting cover. CLEAR TARP (polyester mesh reinforced) - 6 oz. per square yard. For such use as "greenhouse" type of dome shelter. Premium Clear heavy-duty tarps- 3 X 3 Polyester Mesh, 14 Mil Thickness, 6 oz per square yard, grommets every 36 inches with rope reinforced edges and plastic corners for extra strength. All of our clear heavy-duty tarps are weather-proof- providing 3% Treated UV Protection. Every tarp is Waterproof, Mildewproof and Rotproof. NOTE: Your dome outer cover purchase CREDITS you with a $50 "allowance" or "credit" on the listed retail price of the outer cover price seen on the BUY DOME OUTER COVER page. Your chosen TARP costs that are over and above this "standard" $50 CREDIT - requires that YOU pay the fluctuating TARP cost difference. Heavy Duty Clear Poly Tarp - String Reinforced Clear Tarp - Made in USA. Heavy Duty String Reinforced Clear Tarps are great choices for curtains, tent walls and construction enclosures. Size is cut size. Tarp's finished size is up to 3 - 5% smaller. Made in USA. Superior quality clear poly tarp fabrics. Normally ships in 3 - 4 business days. If you don't see the size you needed, please contact us for special order. The Black / Silver Heavy Duty Poly Tarps are manufactured from tough woven polyethlene which is made from a super tight weave at 16x16 per sq inch, which gives you extra durability and longer life. This NEW 8oz. tarp is 100% Waterproof and tear resistant and will give you the extra strength required for many outdoor activities. The extra pennies you will spend on this Super Heavy Duty Tarp will provide you with a stronger and longer living tarp that will work hard to provide you with all your covering requirements. Use it during the summer with its high UV protection and sunblocker qualities or during Fall, Winter & Spring where it will assist in snow melt. Large Brass Grommets Approx. Every 18"
Copyright 2009 WICKER JUNGLE.com. All rights reserved.